The article carries the first results of a research project finalized to the creation of a Non Destructive method of investigation to control the correct execution and about the preservation state of the plates in FRP, utilized in the static consolidation of buidings. 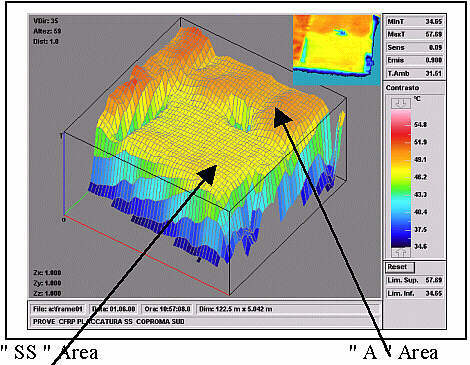 The methodology provides for the utilization of two technics : Infrared VideoThermography and the micro-seismic low- frequency ultrasound. Born for other fields, the composite materials with polymeric matrix, world-wide known by the acronym FRP( Fiber Reinforced Polymers ), are finding more and more application in civil engineering fileld. Their performance features, shortly recalled in the article introduction., make them particularly suitable for static consolidation of buildings, both those in walling and those in reinforced concrete. At present one of the intervention technic more widespread in this field is the plating one, consisting in sticking a laminate in FRP on the surface of the structural element to make stronger after a previous suitable preparation of the support. To have an efficacious intervention it is necessary that the laying is done in a correct way, that the rectilinearly of the fibres and, mostly , sticking to the support is guaranteed. Then, so far, one of the biggest interrogative about the use of these materials is their duration in service conditions, if it is true that actually the high electrochemistry resistance and the mechanical property theoretically make them more durable than traditional materials as steel and concrete, but there is not an experimentation in this field averting the arising of new problems. On the grounds of these observations it is comprehensible how important is an investigation to make both on the stocks , during the process of manufacture to value the correct execution and on already - achieved intervention to estimate the preservation state. Subsequently we describe the first results of these investigation. The topic of the research job is due to the fact that many works are done to restore and recover buildings without a clear and univocal code of the tecnologies used for this materials, while many studies has been done to have their mechanical characterization according a standard way to carry on . The absence of a technical standard regulation compells to make many tests after the installation of this composite materials such as tests referring to the condition of the interface zone between plate and support epossidic Stucco, that affectes the durability of the structural element. 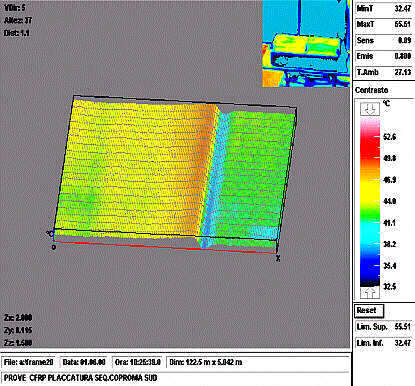 The final test aim of this study, is the creation of a Non Destructive method of investigation to control the correct execution and about the preservation state of the plates in FRP, utilized in the static consolidation of buidings. Is very important to descrribe this study to explain some characteristics of FRP in building engineering . These products are employed in many type of building for their property caractheristics . Frp are made of a matrix and a reinforce .The reinforce is a bulk of parallel fibers dipped in a thermoplastic or thermoindurent matrix whose, function is to keep together the fiber in the desired configuration, to transfer them the agent loadings and to preserve from the environment. The most used renforcing fibers in the civil engineering field are glass, carbon and "aramide" ones. Matrix are usually made of epossidic resins. Matrix and fibers have different mechanical properties, but the their union, together with the right orientation of fibers, gives to the composite material the desired characteristics, depending to the stress to prevent. 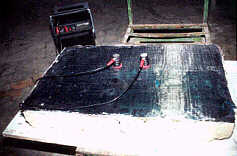 Both clothes with two or more direction warped fibers and dry unidirectional fiber strip to impregnate in situ with epossidic resin to create the reinforcing plate, and laminated pultrused of different shape and dimensions. 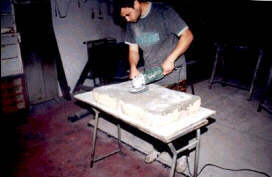 This laminates are usually made in fabrics and so they are often more sure as far as is concerned with their mechanical characteristic For reinforced concrete buildings, Plating technic is substituting the Beton Plaque one consisting of sticking a metallic plate on the surface to strength .One of major uncertainty in the use of this products is about their durability. Moreover anisotrpy and the absence of a technical standard regulation , compells researchers to do complex modellings and laboratory and in situ tests. Also a qualified labour is needed, as little mistakes in working can compromise the right success of work. 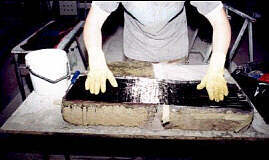 Samples have been done intentionally with localized defects easily traceable thanks to virtual mashes. At the first time, we have made a sample characterized of "macro- defects" to estimate the real possibility of using the above mentioned investigation technics. The sample, 80x50 cm, is made of Naples yellow tuff mixd with lime mortar. 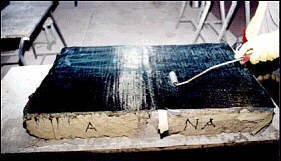 NA- no adhesion ( a plastic film, later removed, has been interponed at the interfaces). in NA zone only the above mentioned steps of preparation occured. 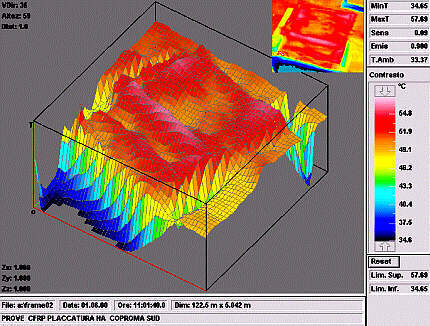 Low frequence Ultrasound method (transmitting and receiving feeler on the same surface) . The disbonding area is detected by the reduction of the received ultrasound wave . 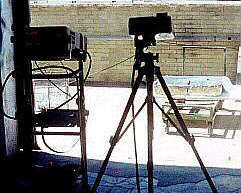 Equipment employed : Therographic System Avio - Huges 200 St with Piced Avio Software included. The standard building has been detected with solar heating . During this time have been recordered same frames . 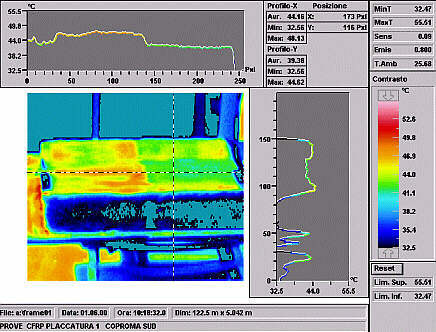 One recordering when the superficiale temperature of the model is fixed . One recordering diring the inreasing of the superficial temperature of the model. 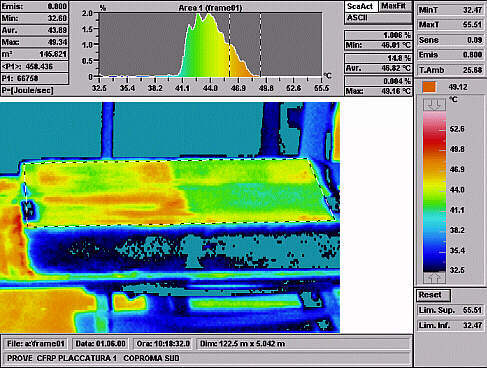 During the heating phase, videothermographic test of the model surface give a lot of interesting informations . 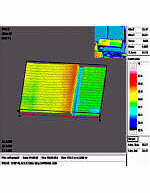 Infrared recordings detected the thermical surface of the model . The thermographic images showed that the three areas with different disbonding and sticking ( A, NA, SS ) have different colours related with different termical values. This result is due to increasing of the termal resistence. This increasing is due to disbonding of the plating from the application surface. In this case there is a reducing of energy transmission trought the support , and so there is an increasing of the superficial temperature of the disbonded laminate. We must underline that in this case has not been possible obtain a clear termographic image for all the disbonded area becouse is vey difficult to guarantee to make a difected plating in all the working area . Some surfaces had a " false " sticking due to plastics between support and resin . So, for the next defected models, it shall very important to improve the tecnique to make them. 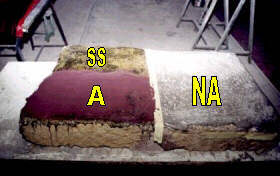 The temperatures for the Area " A" well-sticking , are lower then Area "NA" .The difference, in temperature, amount to about 5° C .
It's important to notice that the area named SS (in which stucco has not been employed) results to a termic level lower than the surface called A (with ideal adhesion). This is easy to explain if we consider that in case the interface is exclusively constituted by Epossidic primer, the laminated is into direct contact with the wall contrivance-plaster that, having an higher termic inertia, remains colder in comparison with the laminated, in case of sticking in ideal conditions this contact is borrowed from the epossidic stucco layer, that having a termic inertia lower than the plaster-walling complex, warms up giving rise to the elevation of the laminated temperature too. In the limits of the same valuability of adhesion, this allows to give prominance that, using this methodology, is possible to to bring out to the easy presence or lack of stucco as interposition between the reinforcement and the application surface. So it is presumable the extension of this methodology to more complex cases then, we think we can introduce some termic values of AT - threshold allowing to estimate the lack of adhesion. In this case a termic difference among areas of different adhesion of 5° C about is noticed. To give prominence to the time variation of the thermic characteristic about the considered surface, a recording of more images in a fixed time interval (about 300 seconds - 20frames of 15 sec/cd) has been executed. The concerned area is recognized on the transition zone between the sticking area and the detached one. The following images show the result of this elaboration. This time sequence (though relatively brief - about 300 seconds) shows that the area on the right remains almost constant and green-coloured, while the detached orange-coloured area increases extention and temperature. In fact it is possible to notice a total touring towards the orange-colour of the whole left-side of the model. On the grounds of the thermic range relative to the disbonded areas (quantified between 46.01 and 49.16 °C) thee following picture show a quantitative eleboration of the value of the average superficial temperature of detachment. In this case for the selected(hatched) area, such temperature (estimated in 46.82°C) is present for 14.8%. In this case we can consider as such value in percentage the real extention of the non-sticking surface. Another interesting method of representation of thermic variation among areas of different adhesion is the realization of a X-Y profile . On the X-axis the passage between the disbonded area and the complete one with a step in central position correspondence. On the Y-axis a thermic level lower and relative constant compared with the value obtained for the X-axis. For this methodology a proper ultrasound equipment with a system of transductors operating in superficila transmission has been employed. 55 kHz - Frequency transductors has been used and Sirio Ultrasuoni RP 4000 CSM Equipment too. 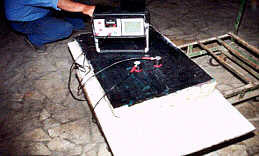 In this case it has been possible to verify if such tecnique allows ( in a first approximation ) to check the presence of disbonding between plating and support. A series of two grilles between the area of different sticking have been realized. By eans of the evalutation of the ultrasound wave attenuation it has been possible to notice the reply difference between the sticking area and the disbonding one. (*) Additional to get to the reference value obtained with both the transuctors on sticking "A" area . The realized measurement shows the possibility to grue prominance to surfaces of disbonding at different manufacture level. ( NA - SS ) . In fact between Table 1 and table 3 it is possible to notice the opportunity to cause a signal variation for the only stucco- absence in SS. Area. 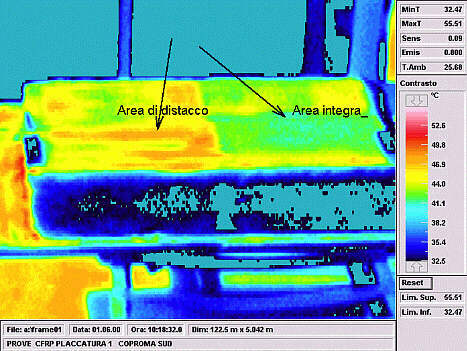 This methodology allows to confirm the already recognized results obtained by thermographic tecnique, just howing the disadvantage to need a physical contact with the surface to inspect. 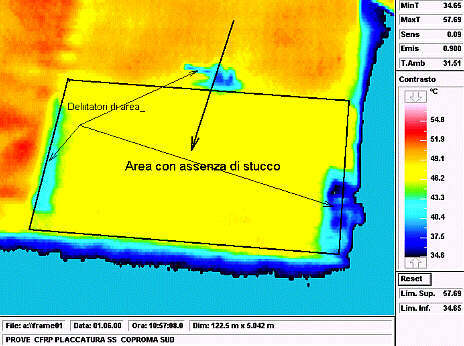 But it is important to underline thet in some contexts this tecnique is alternative to the infrared one when the surfaces to inspect are little exposed to the sunheating and anyhow, it remains a methodology of confirmation to the first thermographic investigation. After all that , at first, both the tecniques can give prominence to the possibilty to discriminate surfaces of disbondingfrom well - sticking surfaces. This is early obtainable and in a fast and repeatable way by means of the thermographic relief . Growing of this study foresee defect models improverments in order to make available proper graduality of imperfections, also including delaminationsof the fibres. For Static consolidation of the structures, we can outline the possibility to obtain a good investigation instrument both for the assembling and the control a long time of plating in FRP .